Cleckheaton's Curtis Free takes the aerial route and is caught by Hanging Heaton's Tom Chippendale last Saturday. Woodlands face neighbours and keen rivals Cleckheaton in the pick of Sunday’s Bradford League Priestley Cup second round ties. Woodlands will be aiming to reverse a 79-run defeat at Cleckheaton in the league a fortnight ago, while both sides are bidding to reach the quarter-finals. Cleckheaton will be without opening batsman Andy Gorrod and the experienced Ian Nicholson, while Woodlands will hope overseas star Sarfraz Ahmed has recovered from an injury which saw him miss last week’s league defeat to Bradford and Bingley. Cleck still have enough firepower to trouble Woodlands as Chris Holliday made 151 not out in their league triumph, which also saw Mohammad Khan hit an unbeaten century. Cleckheaton may lie fourth in the Bradford Premier League but are 36 points behind leaders Pudsey St Lawrence following last week’s defeat to Hanging Heaton. Woodlands are a further six points adrift back in sixth place and both know they are unable to lose any further ground if they are to be serious contenders to Saints. 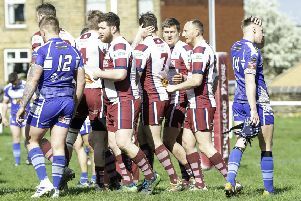 Cleckheaton welcome the champions to Moorend on Saturday knowing defeat will leave them with a huge task of overhauling Pudsey, while Woodlands aim to get back on track when they host New Farnley. Scholes have picked up form, winning their last two games, and go in search of a hat-trick of successes at home to Bradford and Bingley on Saturday. Scholes also have a chance of reaching the Priestley Cup quarter-final when they travel to Championship A side Yeadon on Sunday. East Bierley slipped back into the bottom two following defeat to St Lawrence last week but they can claw their way out with victory over Pudsey Congs on Saturday.